Agra: Tourist Muskan Mahuwakar pictured the Taj Mahal as a dazzling vision of symmetry and beauty but upon reaching the monument, she -- like thousands of other visitors -- was disappointed to find it covered in scaffolding, its once white marble now yellowing due to pollution. Building restoration at one of the country's most popular tourist attractions is now into its fourth year, with work yet to even begin on its imposing dome. "It's disappointing not to get a perfect frame of this immaculate structure," Mahuwakar, a history student, told AFP on her first visit to the Taj Mahal, as nearby cleaners armed with colourful plastic buckets and large mops desperately tried to scrub some lustre back into the stained stone. Other restoration teams scale the facade, blocking views to the ornate carvings engraved on its walls. The interruption to the serenity of visiting one of the seven modern wonders of the world. "The repair has been going on for so long. 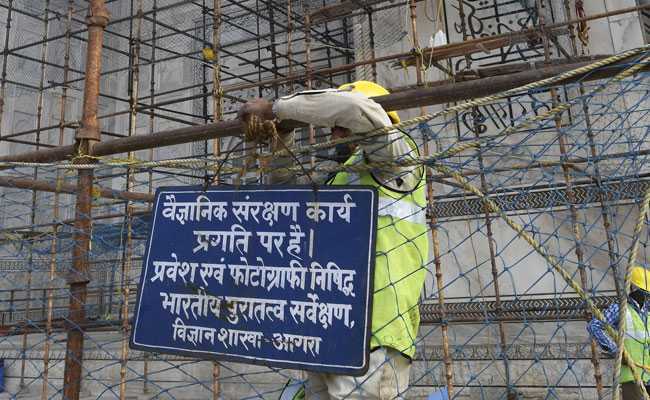 Of course, old monuments need to be conserved, but we must find solutions that are quick and effective," Mahuwakar said, casting a dejected look at the scaffolding around. Authorities reject this but admit they are concerned about how to proceed with handling the fragile central dome. "We have to clean the dome, but the challenge is how to erect the scaffolding," Bhuvan Vikrama, the government archaeologist overseeing restoration efforts, told AFP. "The structure is almost 400 years old, so we can't put any extra load on it. In righting the wrong, we should not wrong the right." Fodor's Travel, a publisher of tourism guidebooks, has advised readers to avoid the Taj until at least 2019 lest visitors be disappointed. The number of local tourists is also being capped to 40,000 a day in a bid to reduce wear and tear on the monument, which was built by Mughal emperor Shah Jahan for his wife Mumtaz Mahal, who died giving birth in 1631. Currently, daily visitor numbers average 10,000-15,000 but can be much higher at weekends, going up to around 70,000. According to government figures, nearly 6.5 million people -- from within the country alone -- visited the historic complex in 2016. MC Mehta, a lawyer, said his battles in court to shift polluting industries -- including a huge crematorium -- had fallen on deaf ears. "No one wants to take hard decisions," Mehta told AFP. "The Taj used to be surrounded by lush greenery, but now there is nothing. Taj is in the last stage of cancer. It is dying, it is gasping for breath."